Pádraig Harrington racked up his third top 10 in four starts as Lucas Bjerregaard snatched the Alfred Dunhill Links Championship at St Andrews and another success for Danish golf. A two-time winner of the event, the Dubliner (47) closed with a bogey-free, three-under 69 to finish tied for seventh on nine-under par at the Old Course and move up to 95th in the Race to Dubai. Bjerregaard closed with 67 to pick up €695,760 for his second European Tour victory, leaping from 25th to tenth in the Race to Dubai standings to give Denmark another reason to celebrate following Thomas Bjorn’s Ryder Cup captaincy, Thorbjorn Olesen’s brilliant debut in Paris and their amateur team’s win in the Eisenhower Trophy at Carton House. “This was a great day and one of the best rounds I’ve played all year,” Bjerregaard said. “I’ve played well recently and come close a few times. I’ve never been to a Ryder Cup before, but Thomas invited me down, so I went. The pair also share the same coach, Scotsman Hugh Marr, while Bjerregaard's caddy is Jonathan Smart, who used to carry Danny Willett's bag and won the Team Championship with Willett in 2016. The Dane's first European Tour win was the Portugal Masters in 2017. On the PGA Tour, Kevin Tway made five straight birdies, including three in a sudden-death playoff against Ryan Moore and Brandt Snedeker, to pick up his first PGA Tour win at the age of 30 in the Safeway Open in California. Tway and his father, eight-time PGA Tour winner Bob, become the 10th father-son duo to win on Tour. Snedeker had a four-shot lead at the turn but came home in 39 for a 74 to tie with Tway (71) and Moore (67) on 14-under par on a day when high winds sent scores soaring. Returning to the par-five 18th, Snedeker was eliminated when he made par to birdies but Tway and Moore both birdied the 18th at the second extra hole before Snedeker failed to match Tway’s birdie when they moved to the 10th for the third extra hole. Phil Mickelson closed with a 72 to tie for 17th on eight-under. West Waterford’s Seamus Power missed the cut by a shot on three-under after a brace of 71s. Spain’s Santiago Luna won the Farmfoods European Senior Masters by two shots from England’s Peter T Wilson and Austria’s Markus Brier on 10 under thanks to a closing 69 at the Forest of Arden. Brendan McGovern tied for 14th on one-under with Des Smyth (74) tied 33rd on six over, and Eamonn Darcy (77) and Philip Walton (76) tied 50th on 17-over. European Tour — Peter Lawrie jumped right back on the horse at Leopard Creek in his first start since losing his European Tour card just three weeks ago. 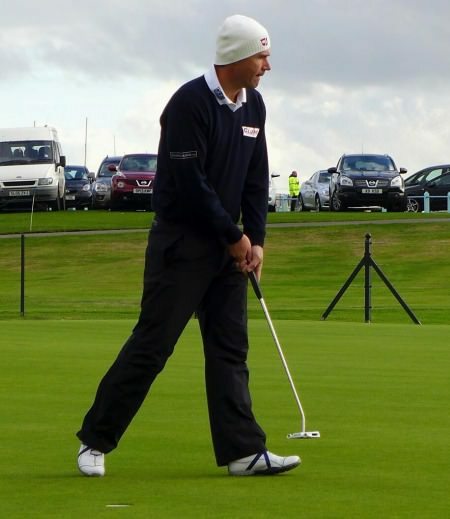 Padraig Harrington warms up with a few putts with his conventional putter. Picture by Norman Mowatt ‏@Beachcomber149 Padraig Harrington is not Oliver Wilson or Tom Lewis but considering his results crisis he could interpret their presence at the top if the leaderboard as a sign that the bad days don’t last forever.